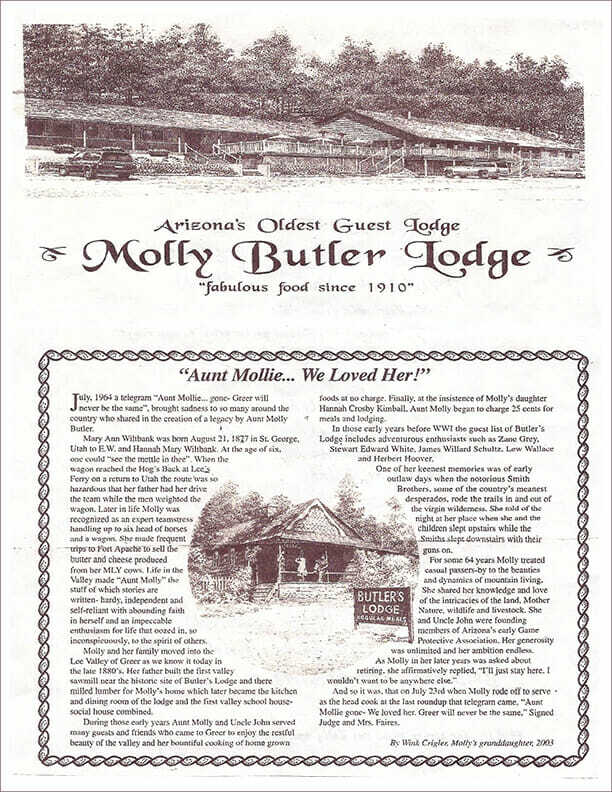 Historic Molly Butler Lodge & Restaurant has been recognized as one of Arizona's Top 25 Restaurants by Arizona Highways magazine and is also ranked amongst the 101 Best places To Eat in Arizona by Dining in Arizona. Herbert Hoover gifted Molly Butler with the White House Cookbook from which she obtained her award-winning Prime Rib Chili recipe, served daily at Historic Molly Butler Lodge & Restaurant. From traditional guest favorites, such as our award-winning Prime Rib, Hot Dang Chile, Molly's Special Steak with Morman Gravy, to nightly chef's specials, fresh vegetarian fare, and casual burgers and appetizers in the bar or outdoor on the heated patio, there's something to satisfy everyone's appetite. In July 1964, a telegram, "Aunt Mollie...gone - Greer will never be the same," brought sadness to so many around the country who shared in the creation of the legacy of Aunt Molly Butler. Mary Ann Wiltbank was born August 21, 1877, in St. George, Utah, to E.W. and Hannah Wiltbank. At the age of six, one could see the mettle in thee. Once, during a return trip to Utah the family wagon reached the Hog's Back at Lee's Ferry and the route became so hazardous her father had her drive the team while the men weighted on the wagon. 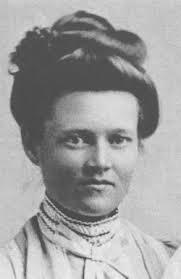 Molly made frequent trips to Fort Apache to sell the butter and cheese produced from her MLY cows and later in life was recognized as an expert teamstress - able to handle up to six head of horses and a wagon. Molly and her family moved into the Lee Valley of Greer - as we know if today - in the late 1880's. Her father built the first valley sawmill near the historic site of Butler's Lodge and there milled lumber, some of which was used for Molly's home. Later, this building became the kitchen and dining room of the lodge and the first Valley school house-social house combined. Life in the Valley molded Aunt Molly into the stuff of which stories are written - hardy, independent and self-reliant, with abounding faith in herself and an impeccable enthusiasm for life that oozed, inconspicuously, into the spirit of others. During those early years, Aunt Molly And Uncle John served many guests and friends who came to Greer to enjoy the restful beauty of the Valley and her bountiful cooking of home-grown foods at no charge. At the insistence of Molly's daughter, Hannah Crosby Kimball, Aunt Molly finally began to charge 25 cents for meals and lodging. In the early years before WWI, the guest list of Butler's Lodge included adventurous enthusiasts such as Zane Grey, Stewart Edward White, James Willard Schultz, Lew Wallace, and Herbert Hoover. One of Molly's keenest memories was of early outlaw days - a time when the notorious Smith brothers, some of the country's meanest desperadoes, rode the trails in and out of the virgin wilderness. She told of a night at her place when she and the children slept upstairs while the Smiths slept downstairs still wearing their guns. For some 64 years Molly treated casual passersby to the beauties and dynamics of mountain living. She shared her knowledge and love of the intracacies of the land, Mother Nature, wildlife, and livestock. She and her husband, Uncle John, were founding members of Arizona's early Game Protection Association. Molly's generousity was unlimited and her ambition endless. In her later years, when asked about retiring, she affirmly replied, "I'll just stay here. I wouldn't want to be anywhere else." And so it was, that on July 23rd, when Molly rode off to serve as the head cook at the last roundup, that telegram came. "Aunt Mollie gone - We loved her. Greer will never be the same." Signed Judge and Mrs. Faires.